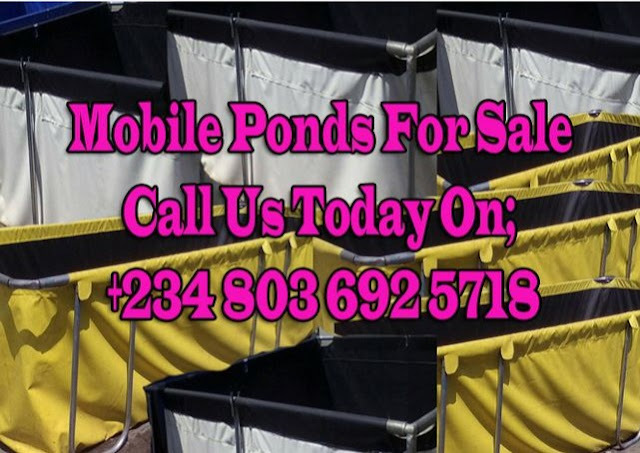 Affordable Tarpaulin/Collapsible Mobile Fish Pond is all you need to get started with your fish farming business. 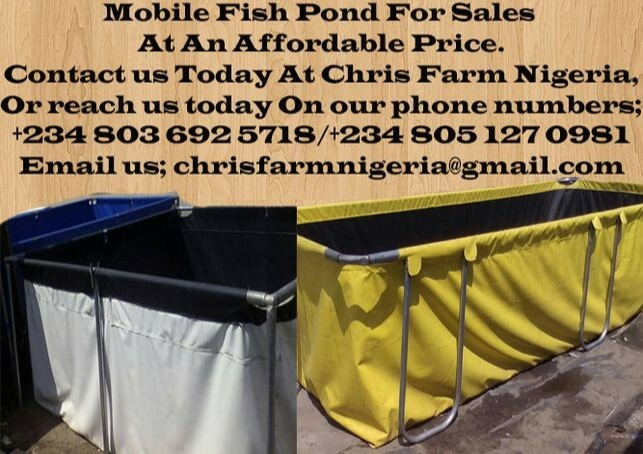 As a matter of facts, with our affordable tarpaulin/collapsible mobile fish pond, we have revolutionized fish farming in Nigeria. 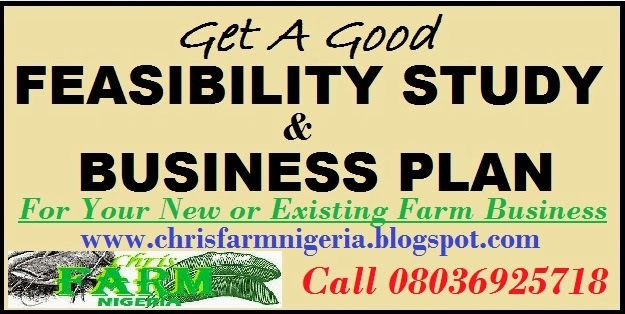 Similarly, making it easier for anyone to get involved with fish farming business. 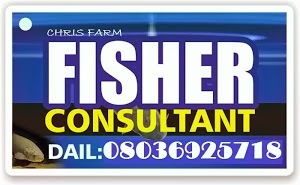 We welcome both retailers and direct consumers of our tarpaulin/collapsible mobile fish pond to do business with us. 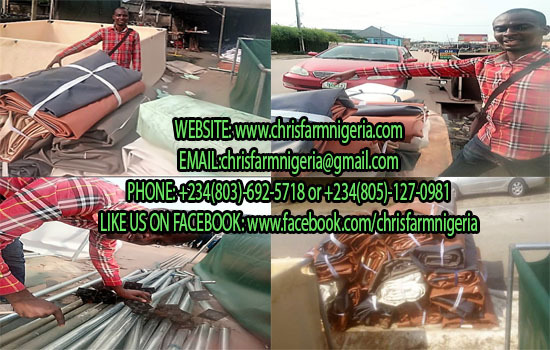 At Chris Farms and Extension Services Alias Chris Farm Nigeria, you can be rest assured of getting the genuine tarpaulin/collapsible mobile fish pond for your fish farming business. With this type of fish pond, there is no need to put up with high cost and all the inconveniences that come with concrete, earthen or plastic pod. It does not require any sort of permanent construction on land. In like manner, making it suitable for tenants, indoor/outdoor usage (provided there is adequate aeration). Furthermore, it also well-suited for backyard fish ponds as well as large scale fish farm projects. This tarpaulin/collapsible mobile fish pond is not only durable and less expensive, but can be easily installed. Our tarpaulin/collapsible mobile fish pond are made of high quality Tarpaulin with 1 ½ galvanize pipes which serves as stands. All our tarpaulin/collapsible mobile fish pond has a height of 4 feet high with different sizes. These collapsible mobile ponds are all movable. You can dismantle them at any time. You also place them on your homes, farms or any convenience location to grow your fishes. Sample dimension using 18ft by 8ft collapsible mobile pond. The rods are made up of 1 ½ galvanize pipe, of which the 2 sides are 18ft long while the other side are 8ft long. The stands are made up of 1 ½ galvanize pipe, of which it has 14 stands of 3ft 10 inch height each (that is 4 pipe on each four ends and two supporting pipes on each side). The top joint completes the pipe to be 4ft high. This is because the top is made up of weld one one-quarter pipe, giving it a V-shape ends. This enable the pipe to fit-in into the 1 ½ galvanize pipe of the four edge. Four stand each on both side (4 stands) are supporting stand that help to carry the weight of the water when the pressure increases. Please note, this is not the four stands of the four edges. These stands are supporting pipes which are made up of 3ft 10 inch height pipe with two short ½ inch rod which is brazed on both end, which gives a v-shape to hold the main pipe at the center. The stands should be placed on a welded lid to avoid penetration of pipe into the ground. Is not advisable to fill up the water to the brim to avoid breakage. Fill up water level to half or above half a little to enjoy total safety of your mobile ponds. Perfect places to stand mobile pond are; cemented floors, interlocking tiles, wooden floors or any solid platform to avoid penetration of stands into any sinking platforms, like sinking sand. Areas where there are sinking floors, places on a material like block, stone, ion or something strong to avoid penetration on the ground. If it occurs, there is ban to be breakage, be warned. 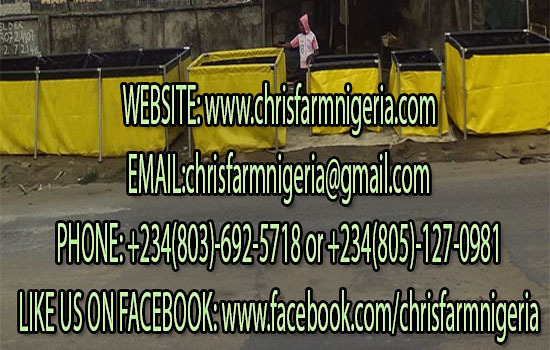 Should in case you want to make any payment, login to; www.chrisfarmnigeria.com and click on Payment on our website to make any payment. There are different banks you can select from to make a payment. Suitable for backyard or small scale fish farms in the compound, as well as large scale projects. 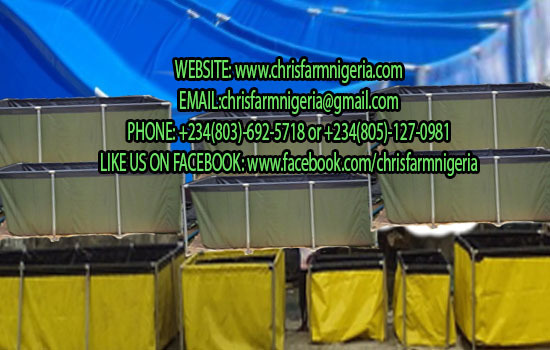 Chris Farms and Extension Services alias Chris farm Nigeria’s tarpaulin/collapsible mobile fish pond can be used for the farming of shrimps, prawns and all tropical fishes including Clarias gariepinus, Heterobranchus longifillis, Hetero-clarias and other Catfish species; Tilapia and other Chichlid species, etc. All our tarpaulin/collapsible mobile fish pond has a height of 4ft with different length and breathe depending on your specification. Our delivery ranges from days to a maximum of two weeks depending on our customer location. We also employ the services of reliable transport companies that suit your location. 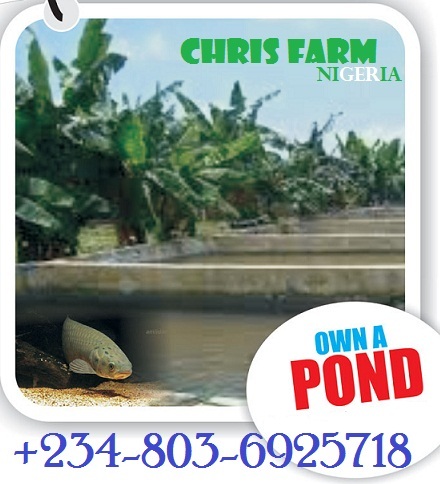 Chris Farms and Extension Services alias Chris farm Nigeria also offer premium services to Customers that orders above 10 tarpaulin/collapsible mobile fish ponds, like self-delivery and installation, of which services rendered are paid by the customers. NIPOST are used as delivery channels to customers who lives outside Nigeria. 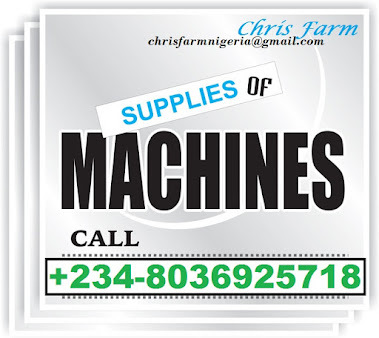 In like manner, NIPOST is also used to deliver products to customers who felt that NIPOST is a better option for them. Stability; are suitable for large scale, small scale fish farming in indoor or outdoor areas like household compound, backyard, garage, garden, etc.